MONTREAL & RAPID LAKE—For two weeks now, members of the Algonquin community of Barriere Lake have been standing fast in their opposition to clearcut logging on their territory. 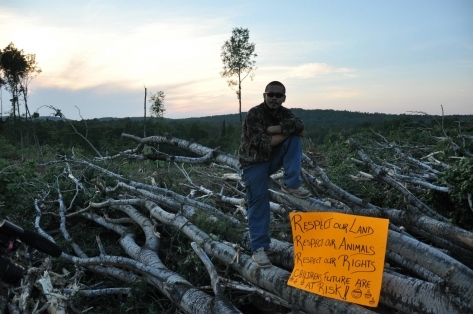 On July 2, 2012, residents of Barriere Lake, located four hours north of Montreal, noticed loggers from Resolute Forest Products (formerly known as Abitibi Bowater Inc.) on their territory. The presence of the loggers came as a shock, since no consultation process had been carried out with the community members who harvest from that land. These logging operations are also surprising due to an ongoing moratorium on corporate-based logging of the Algonquin land. Since 1991, Algonquins of Barriere Lake (ABL) have been fighting for the provincial and federal governments to respect an agreement they signed that allows for co-management of the land and guarantees the community a say in the exploitation of resources on their land. ABL members moved quickly to stop the logging. 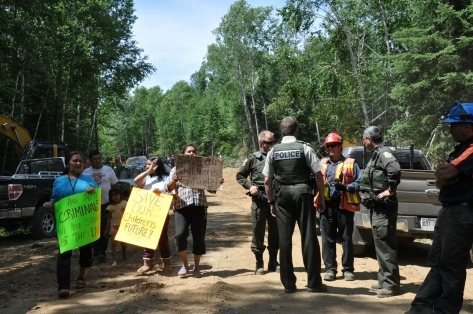 Community members protested along the road leading to the clearcut site. They had to move quickly, since no advance warning of the logging was given. 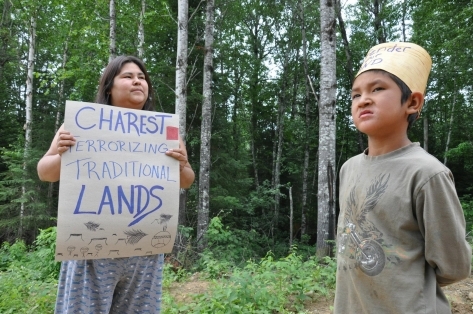 On July 4, they set up a protest camp along the logging road leading to the clearcut zone. They say they were able to stop the initial logging. On July 9, they delivered a letter to both the loggers and members of the Surete du Quebec (SQ), demanding the logging be halted. On July 10, though, the logging resumed. "It was very hard to find out what's happening [with the logging] because we have no communication, especially with the [Indian and Northern Affairs-approved] council that is there right now. They don't really say what's going on, they don't give us any information whatsoever...They don't say nothing," said community member Severe Ratt. (Indian and Northern Affairs Canada is now known as Aboriginal Affairs and Northern Development Canada). In the summer of 2010, under the guise of resolving an internal governance dispute, the federal government imposed on Barriere Lake section 74 of the Indian Act, removing their traditional governance structure and imposing a band council system. The band council government is seen by many among the ABL as collaborating with the government and few people in the area recognize its leadership. While no formal notice of the logging was given to most members of the community, it did not take long for residents of the land to realize what was happening. The family that harvests that part of the ABL territory—hunting, fishing, collecting food and medicine—alerted others nearly two weeks ago that logging equipment had been moved onto the land. Community members, including Jeannette Wawatie, one of the harvesters, say they contacted the Quebec Ministry of Natural Resources and Wildlife (MRNF) to get more information, but weren't given clear answers. "[Jeannette] called [MRNF] to see when they were going to start cutting. They told her, a couple days, a couple weeks, they weren't really giving her a straight answer. So we were in and out of the place, just monitoring the area," explained Norman Matchewan, a community spokesperson. "And last week, on Monday night [July 9, 2012], we came for a ride and they were bringing in their machines. And Tuesday we came back and they had started working. So we got our camping gear and we came to set up a camp." 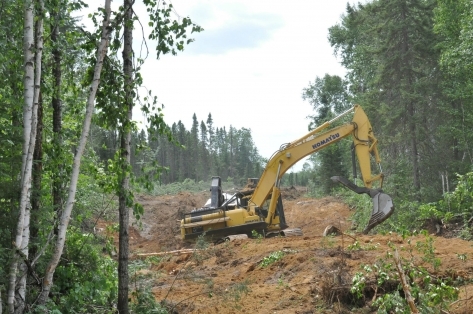 The logging is being carried out by Resolute Forestry Products, formerly Abitibi Bowater Inc. One of the main questions among the ABL is how the company got the go-ahead to log on their land. "[Since the logging began] we met with [MRNF] and SAA [Secretariat aux affaires autochtones]...[MRNF] was saying they consulted, SAA was saying they didn't do any consultation. So there was no consultation, as to Gabriel's knowledge," said Matchewan. "Gabriel Wawatie is the main harvester, he says that he never got consulted, never gave consent to the cutting." Matchewan added that the company says they have a document they claim Gabriel Wawatie signed consenting to the logging. Matchewan pointed out that no one could provide the document and that Wawatie has been at the protest camp all week, opposing the cutting. On Tuesday, July 17, a Resolute spokesperson told the Montreal Gazette that the company negotiated the logging with the Barriere Lake band council, and that is is the responsibility of the council to consult with the rest of the community, not Resolute's. It didn't take long after the protest camp was set up for the police to arrive. While the police presence mostly consisted of SQ officers, since the land around Barriere Lake is under their jurisdiction, riot police from Montreal were also dispatched. While there have been no arrests yet, the police presence has been visible and intimidating, according to both ABL members and solidarity activists who have traveled to the camp to lend support and deliver supplies. Over a dozen police cars, several paddy wagons and an SQ helicopter have been present. Police have been warning community members not to interfere with the logging and to wait for negotiations with the government. One officer even told protesters that he was there to protect them as much as to protect the loggers. "They came in and they were saying, 'We're here to protect you,'" said Ratt. "But really, in about three, four days, they really showed their true colours. Why they are there is to protect the loggers. So they wouldn't even let us pass. They just stop us and say, 'Stay on your side, don't cross the border, or you'll be charged.'" 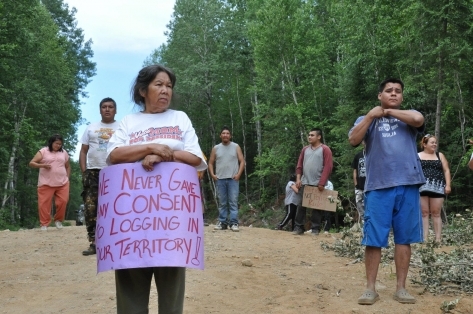 Despite the threats, on Wednesday, community members still moved out onto the land being logged. When the Resolute employees saw them in their path, they shut down their equipment and stopped their work. But logging resumed by Thursday, and despite guarantees from the SQ that the cutting would be halted from Friday at noon until Monday, it continued well into the weekend. 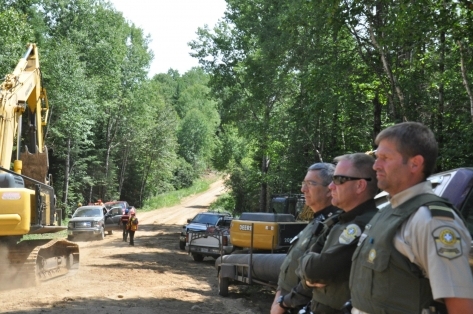 When logging began again Monday, ABL community members and supporters repeated their tactic of moving out into the path of the cutting, and logging was once again halted, although the workers and equipment are still there. While the ABL blame the logging company for attacking their land, they also place a large part of the responsibility on the Quebec government. "The Charest government has acted in bad faith, giving this company the go-ahead to log while they ignore their signed agreements with our community," said Matchewan in a press release on Monday, July 16. "It has left us with no choice but to try to stop forestry operations. We have been waiting 20 years for the Quebec government to honour their agreements." In the same release, the ABL calls on the Quebec government to respect the 1991 Trilateral Agreement, signed by the Algonquin of Barriere Lake, the Quebec government and the Canadian government, which they call a "landmark sustainable development agreement." The agreement, they say, "is intended to allow logging to continue while protecting the Algonquins' way of life and giving them a $1.5 million share of the $100 million in resource revenue that comes out of their territory every year." Above, a community member places a sign on top of some of the recently downed trees in ABL territory. "You know, this land is important to us, especially the people who harvest off this territory," said Matchewan. 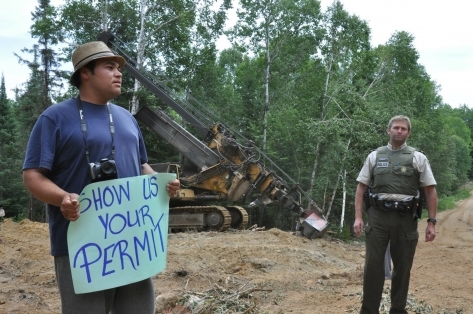 "Because right now they're destroying a huge moose habitat, bear dens, sacred sites. They don't care about the stuff that is out there, our medicine. "They're just going in to destroy it, and it's devastating. It's hard on the community. Seeing that their children's future is being destroyed, and when the land is destroyed, we're destroyed. "Our identity is in danger." Keeping the logging at bay has required a constant presence on the land. Logging has been continuing intermittently since Monday evening, despite ABL members' efforts. There has also been no firm response from the Quebec government about the nature of Resolute's permit or for how long the logging will take place. In the meantime, the protest camp continues. According to reports from the community, even more members arrived to take part as of Tuesday morning, vowing they will stay as long as the loggers and their machinery are present. 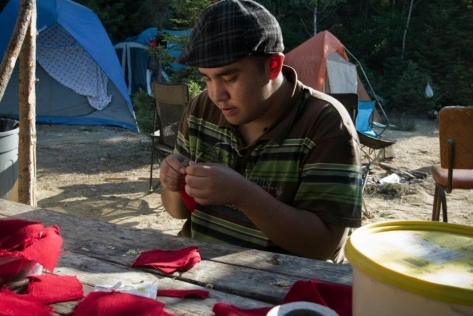 Above, Tillis Wawatie, 18, an Algonquin student, cuts out red squares for the Algonquins of Barriere Lake who have set up a camp to protect their land against forestry exploitation. "It's the same government which created Law 78 to silence the movement against tuition fee increases and austerity measures that has granted companies the right to exploit the ancestral land of Indigenous people," wrote a member of Indigenous Peoples Solidarity Movement Ottawa (IPSMO) on Facebook when they posted this photo. IPSMO and Barriere Lake Solidarity are two non-Indigenous groups that have been rallying support for Barriere Lake in its fight. The solidarity groups are encouraging people to send letters to government officials, and are organizing a casserole solidarity demonstration in Montreal today, Wednesday, July 18, at 11:30am in front of Resolute's offices in downtown Montreal. "It's just like when they sent us to residential schools. We lost so many things," said Severe Ratt. "Again, now, they're destroying, trying to take our language, our beliefs...now it's our way of life too. They're still going at it, you know. It's so sad to see what's happening. Sometimes at night we're crying just to see, because we're not going to see this anymore, the beauty. They say they are going to restore the bush, but it's not going to be the same. It's all going to be plantation. They're only planting one species. "I hope people will try to support us." Tim McSorley is an editor with The Dominion and a member of the Montreal Media Co-op (CMM). David Koch, a Montreal community radio journalist, and Neal Rockwell, a Montreal photographer and film-maker and CMM member, conducted the interviews included in this piece. Pei-Ju Wang, who provided the photos, is a photographer and member of IPSMO.